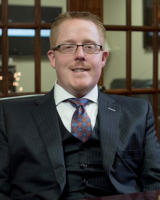 Jeffrey A. Hensley, Esq., is a family law attorney in Tulsa, Oklahoma. He is the principal attorney and president of Hensley Legal Services, PLLC, and he represents clients throughout northeast Oklahoma in divorce-related matters including division of family assets, child custody and support, spousal support, fathers’ rights, grandparents’ rights, guardianship, visitation and paternity issues. With experience in both mediation and litigation, Mr. Hensley works diligently to resolve matters without taking the issue to court whenever possible, but he fights vigorously for his clients’ rights in the courtroom when it is necessary. Hensley Legal Services, PLLC, in Tulsa is focused on hands-on representation for clients throughout northeast Oklahoma dealing with the life-changing impact of divorce. The end of a marriage combines legal complexities and emotionally charged issues. We also spend the time necessary with you to assess your goals and educate you on your rights in child custody and support, property division, and paternity matters. Once we take on your divorce case, we remain accessible throughout the entire process — with a two-hour callback time frame — and provide continuous updates on the progress of your case.